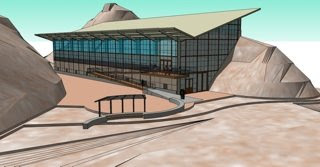 National Parks Traveler is reporting that Dinosaur National Monument is closer to being back on track, as artist's renderings of a new visitor center and quarry exhibit hall have been released and bidding on construction contracts will begin this autumn. In April it was announced that ARRA funds secured for the NPS will be used to rebuild the Quarry visitor center, which has been shut down because of structural concerns since 2006, or as I refer to it, "The Year The Allosaurs Cried." The buildings will be green, too, which though being an obvious necessity still seems like a relief. I look forward to the day when it isn't a relief. Barack should claim dibs on the next new species found on the property. Stegosaurus obamae, maybe? Ceratosaurus baracki? He's got a lichen already, but you know the man ain't satisfied. 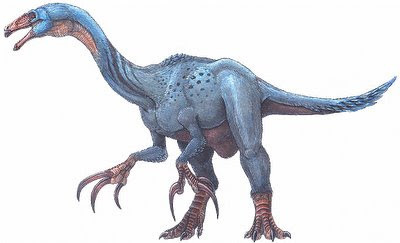 I think my ideal dinosaur tattoo would be something like a Troodon on my tummy, and my chest hair would be a cute little hairdo. I would also need to solve the problem of growing hair on my chest. Therizinosaurs, including the recently named species Nothronychus graffami from Utah, were maniraptors, a group of theropods which also includes the dromaeosaurs, or raptors. A study led by The Field Museum's Lindsay Zanno has found that among their maniraptoran kin, the therizinosaurs were the earliest branch, pointing to the possibility that they and the dromaeosaurs may have shared an omnivorous or herbivorous ancestor, and hypercarnivory (or the exclusive eating of meat) was not necessarily the norm. It's always nice to have more detailed shading of the frequently cartoonified dinosaurs, which are usually depicted strictly as belonging to two teams: meat-eaters and veggiesauruses. Dinosaurs dominated terrestrial ecosystems for hundreds of millions of years, so it makes sense that their diverse forms evolved to fill niches in all kinds of neat ways. The therizinosaurs are striking in the way they subvert pop culture's roster of standby dinos. Adding a bit of maritime intrigue to the N. grafammi specimen: it was discovered in sediment that would have been 60 to 100 miles from shore, among the remains of ammonites (which with their spiral shells superficially resemble the nautilus but are closer kin to squids). I love when a fossil gives such vivid fuel to the imagination. The discovery adds to science's understanding of therizinosaur, a dinosaur belonging to the therapod (sic) family, whose members include Tyrannosaurus rex and Velociraptor. The study suggests these famous predators may have evolved from plant-eating ancestors. T. rex and the other tyrannosauroids are distant cousins to the maniraptors. The study only deals with maniraptors and doesn't suggest that T. rex had a vegetarian ancestor. This seems to be a pretty common mistake: reporters throwing out the names of one of the classic dinosaurs as a sort of shorthand. A traveling exhibit on recent discoveries of therizinosaurs in the United States, THERIZINOSAUR—Mystery of the Sickle-Claw Dinosaur, will be at the Museum of Northern Arizona until August 30, 2009. More N. grafammi: Live Science, Dinosaur Tracking, and nice personal observations at Chinleana. Dinosaur Tracking has posted a list of the five worst dinosaur movies ever made. Of course, such a thing is open to endless debate, and as I haven't seen any of the movies on the list, I'm not prepared to argue with them. I would add one to the list, or at least offer it for consideration: Super Mario Brothers. The makers of SMB had the fine idea to take an inherently stupid idea for a movie (stereotypical Italian plumber jumps on turtles, saves princess) and inject some extremely sketchy pseudoscientific mumbo-jumbo into it. They cook up an "evolution ray" to explain why there are fungus-people and lizard-people. I mean, I can accept that Hollywood needs to depart from the strict facts of existence to make a viable piece of entertainment. It's nice when it can at least be a little clever. Exchanges like the following don't quite measure up: "What single-celled organism did you evolve from?" "Tyannosaurus rex. The lizard king!" For a story like Jurassic Park, we need some cooked up explanation that at least sounds reasonable on the surface. For Super Mario, I think it's overthinking it a wee bit. I can't quite figure out the studio's thought process here. The easiest, fastest, cheapest way would be to make a nice, simple, silly Super Mario movie. It's based on a video game, so get it out as fast as possible to put the kids and their parents into the theaters. Instead, they created an effects-laden, confusingly-plotted monstrosity with actual actors like Bob Hoskins, John Leguizamo, and Dennis Hopper. Were they trying to create something more than a stupid, silly Super Mario movie? I just don't get it. Jump to the four-minute mark for a nice instance of science being fed through the ol' salad shooter. I tried to explain why I like dinosaurs so much yesterday. It's hard, because it's essentially an exercise in complicating something pretty simple. I suppose my reasons, and most of ours, can be pretty well expressed by this compilation of Google results. Most of which, I'd guess, are from children. ... they give you a real sense of the vastness of time. ...they are fun to read about. ...they are so fierce and they ruled the earth many times. ...they were big, fierce, and extinct. ...they tell me about distant times and lands and they are visually striking. ...they beat each other up and they have stinky breath. ... they lived log ago and I read lots of books about them and I know lot of them kinds I want to visit natural museum. ...they are special to me. ...they are my best animal. ...they are big and they have very sharp teeth like no other animal. ...they're really awesome, and I like the Tyrannosaurus Rex's teeth because they're really sharp. ...they are so different from anything today. ...I was excited when I think of them. ...he is smart,fast,neat and COOL!! ...it's fast, has sharp claws and it's real cool!! ...they are swift and sneeky and you would never know there was one behind you until your flesh is getting torn off your bones. ...they hunt in packs and eat meat like me. ...it has a big claw. ...it could take down almost any dinosaur! ...of those cool fans on its back. ...it had bony plates on its back. ...they have many ways to protect themselves. ...THEY HIT OTHER DINOSAURS WITH THEIR SPIKED TAILS. ...it has spikes on it and I spikes. ...he has four spikes on his tail for protection and I think thats really neat! ...I like my meat to be grass-fed and free range. ...its plates could turn red. ...they always appear to me as the "intelligent noble" dinosaur. ...he's the bestest herbivore fighter! ...they are cleaver and tuff. ...he is smart and he is cute. ...I'm in a band called the dinosaur project and we all have stage names, and mines the best because it's tri-sarah-tops. ...he has horns and fights T-Rex. ...it was not afraid to stand up to any other dinosaur. ...of what it's name means - 3 horned face. ...it is a plant eater. ...it has a cool head with the sticky-uppy crown thing and three horns. ...it had three horns to protect it'sself from danger. ...they have my name in them. ...it is a cool name. This is the first post on Love in the Time of Chasmosaurs, a dinosaur blog. It's taken me a year of blogging at Gentleman's Choice to figure out that the secret to building any kind of readership is to focus on a topic. And for me, a dinosaur blog is the right way to go. Like plenty of adults, I somehow never managed to outgrow dinosaurs. I suppose it's for all of the usual reasons cited: the titanic proportions, the array of anatomical weaponry, defenses, and more obscure adornments, the mystery of their disappearance, the fact that they were really real monsters. Dinosaurs are just such a joy. They were my entrance ramp to science, really. Everything I've learned about natural history, evolution, geology, the latin language... it all started with the old mount of an albertosaur standing over a fallen lambeosaur in the entrance hall of the Field Museum (pre-Sue, of course). Most of the great dinosaur blogs are by paleontologists, either of the professional or armchair persuasion. I can't even claim to be a footstool paleontologist, so while I definitely plan on writing about new developments in our understanding of dinosaurs, I'll be writing about fluffier, pop cultural stuff. Dinosaurs are one of those places where science and pop culture intersect loudly, which is endlessly entertaining to me. Ultimately, I hope I can write a blog that's informs those who don't know as much as I do while entertaining those who do. And if I do attract a paleontologist or two, I absolutely invite clarifications and criticisms. Seriously, take me to the woodshed when I'm talking above my pay grade. I'll close with a nice piece of paleoart. I'm going to feature plenty of paleoart. Paleoart is one of the awesome things we can rely on. Until next time, happy trails. The Hatching, originally uploaded by Zero Gravity.